If you’re looking to entertain throughout the summer, why not consider an outdoor structure such as a gazebo to enhance your outdoor living space? As the weather starts warming up in April, now is the perfect time to start planning any additions to your landscape. If you’re looking to entertain throughout the summer, why not consider an outdoor structure such as a gazebo to enhance your outdoor living space? Not only are gazebos beautiful additions to your existing deck or patio, but they are also great functional pieces for seating guests as you entertain at your home throughout the summer. 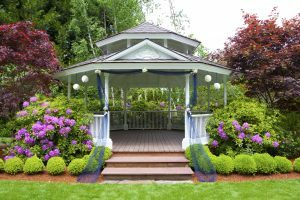 Dress up your beautiful gazebo with an extension of your garden. By bringing your flowers into and around your new structure, your landscape design can continue seamlessly throughout your yard with one cohesive look. Consider building flower beds on the outside ledges or installing hooks for hanging baskets to liven up your landscape even more with flowers in your new space. If you are hosting a party in your outdoor space, the fun doesn’t have to stop because of a summer shower. A gazebo is the perfect place to take cover during a quick burst of rain, keeping your guests dry while still enjoying a great view of your landscape. Enjoy your yard regardless of the weather with a new space to sit comfortably throughout the season. Similar to a deck or patio, your gazebo can be customized to fit the style and design of your outdoor living space. Just as the structure alone can enhance your landscape, the design of the structure should also complement your existing landscape design. In addition to style, it should also be able to comfortably fit your guests and family so that everyone can enjoy this part of your home. By working with our team of experts at Mid Atlantic Deck and Fence, you can bring your dream design to life just in time for the warmer months of 2018. Ready for a New Gazebo? Mid-Atlantic Deck & Fence has almost 30 years of experience in building beautiful custom fences, gazebos, screened-in porches, and decks throughout the state of Maryland. We have the expertise to design your dream fence or custom deck and have it installed in a headache-free process. Give us a call at 1-800-833-9310 or visit us online for a quote today! We offer many different styles of fencing and decking in addition to custom options designed specifically to suit your preferences and tastes. To see examples of our work and get more tips on how to choose the right gazebo for your family, follow us on Facebook, Twitter, Houzz, Pinterest, Google+,YouTube, and LinkedIn.